Tom’s hardware has reviewed seagate eSATA 500GB ST3500601XS-RK hard disk drive. This drive has capacity to store 500GB of data, runs at 7200 rpm and has whooping 16MB cache. The eSATA’s strength lies in the fact that it offers 300 Gbit/s transfer bandwidth when compared to 400 to 480 Mbit/s of USB based interface. In addition to that eSATA also features hot swapping capability and that’s the reason why it is gaining popularity. Cable length is restricted to 2m, USB and Firewire span longer distances. USB and Firewire require conversion of all communication with the external disk, so external USB/Firewire enclosures include a PATA or SATA bridge chip that translates from the ATA protocol to USB or Firewire. Drive features like S.M.A.R.T. cannot be exploited that way and the achievable transfer speed with USB/Firewire is only about half of the entire bus data rate of about 50MB/s. This limited effective data transfer rate becomes very visible when using an external RAID array and also with fast single disks which may yield well over 70MB/s during real use. Currently, most PC motherboards do not have an eSATA connector. 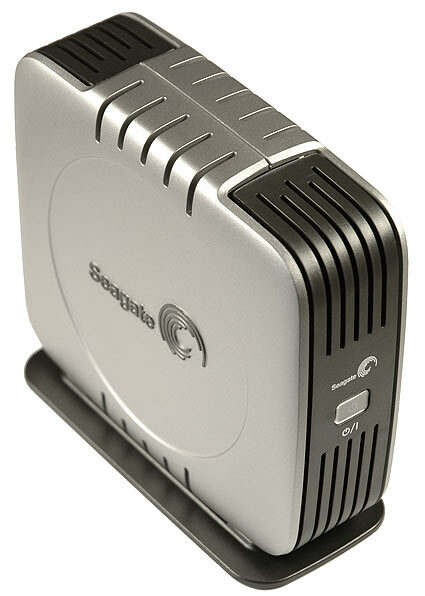 eSATA may be enabled through the addition of an eSATA host bus adapter (HBA) or bracket connector for desktop systems or with a Cardbus or ExpressCard for notebooks. eSATA does not provide power, which means that external 2.5″ disks which would otherwise be powered over the USB or Firewire cable need a separate power cable when connected over eSATA. The slow access times seem even stranger in light of the very high read/write transfer performance, but transfer rates are what’s important in a drive like this. We wonder if perhaps a driver update might speed up the Promise eSATA300 TX2 card’s access times with the eSATA drive. That’s speculation, but what we are certain of is that Seagate’s eSATA performs where it counts: quickly moving huge amounts of data to and from its platters. The only other area of note would be the eSATA’s inability to easily interface with multiple PCs, as mentioned above. This problem doesn’t really lie with the eSATA drive itself, but the lack of external SATA ports on most available motherboards. Still, it would have been nice if Seagate had addressed this with a USB or Firewire port as a backup option. But these issues are relatively minor. External SATA is a great idea, and we applaud Seagate’s entry into this relatively new market. The ST3500601XS-RK is a solid product and we can recommend it highly to those who need fast, mobile data transfer. experiencing some small security problems with my latest site and I would like to find something more safeguarded. reading this web site’s post to be updated regularly. It carries nice material.